Picture of the Cobb House (built circa 1890s) prior to demolishing it to make room for a new bank building. Enlarge this turn of the century postcard of East Main St., to see the facade of the Cobb House (rt). The Cobb House was demolished in the late 1960s to make room for the Southern Bank and Trust Building seen here. The Friedheim Home had been razed to make room for the parking lot. 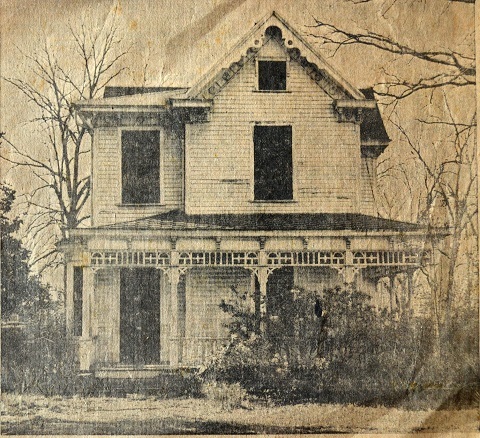 The Cobb home was one of the smaller dwellings on East Main Street and was dwarfed by the expansive Friedheim home next door, but it had beautiful Gothic Revival lines of an late 19th century house and along with the old Mills house [burned and replace by the Friedheim house] on East Main were two of the city's oldest structures. Mr. C.L. Cobb of Rock Hill was one of the most influential citizens in Rock Hill's development history. A banker and gigantic supporter of economic development for Rock Hill, he helped move Rock Hill from a small farming community to an industrial powerhouse by personally becoming heavily involved in helping attract both the Bleachery (Lowenstein and Sons), as well the Celanese Corporation, to locate in Rock Hill. The Cobb home was demolished to make room for a bank expansion in ca. 1970 to make room for a bank building and is now part of the Comporium Operations Center lot.